Come See Us on Stand K49, at the BRISBANE HOME SHOW. FRI 8 – SUN 10 SEPTEMBER 2017. Brisbane Convention & Exhibition Centre. 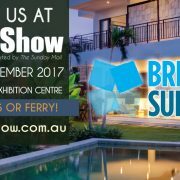 Exclusive Home Show Packages have been especially designed put together to save you Thousands on your spa pool or swim spa purchase from the show. You will not get a better deal! Every spa has been reduced for you!